To start off this past weekend was the statue unveiling on Friday at 3 p.m. 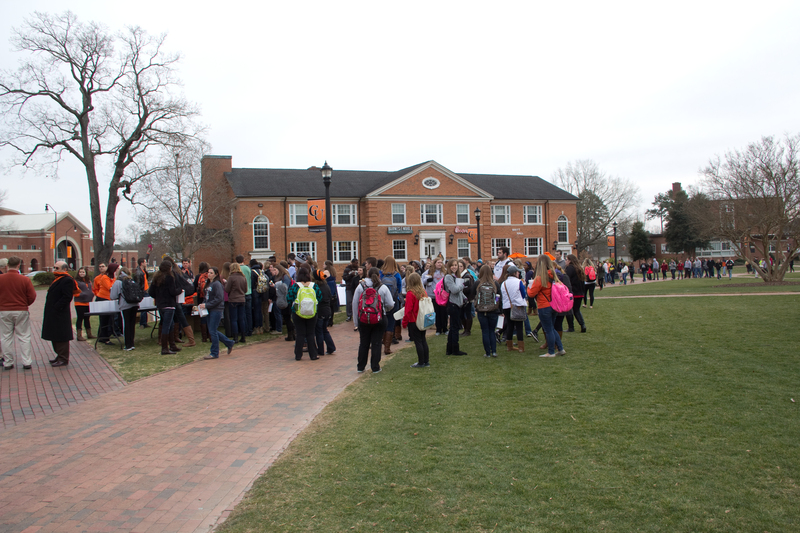 This last event of Founder’s Week had shirts and cupcakes free to students which made many people come out. By 2:30 there was a long line of students who wanted to make sure they received a t-shirt of their size. Once each student had been given a ticket for a t-shirt and a cupcake or two, the ceremony began. Descendants of founder J.A. Campbell were there to see the statue of him unveiled. It was really an exciting thing to have the family of J.A. Campbell with us for the ceremony on February 6th. 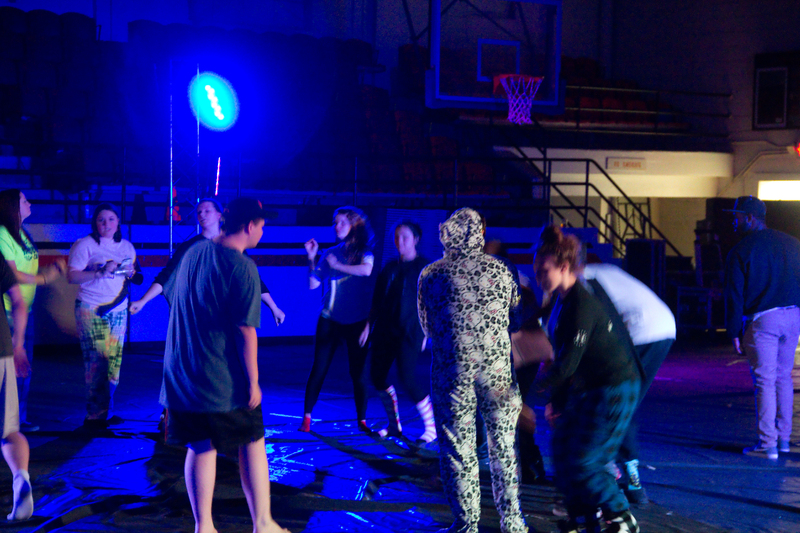 That Friday night, students gathered in Carter Gym for Sleepless Nights, a charity dance. Students were to bring school supplies of an entrance fee of $2 to support local students. The students danced the night away in their pajamas. On Saturday, campus was filled with many students from local middle and high schools for Science Olympiad. Many Campbell students volunteered by supervising and grading the events. Greek recruitment also ended this past weekend and our campus now has many new Greek members to different sororities and fraternities. Friday February 13: Men and Women’s tennis matches at 2 p.m. Baseball game at 3 p.m. Dracula Untold will be shown at 9 p.m. in Turner Auditorium. Saturday February 14: Valentine’s Day! At 1 p.m. is the women’s basketball game. At 3 p.m. is a baseball game at at 4 p.m. is the man’s basketball game. This past weekend was the second annual Desert Dive at Keith Hills Pool. About 30 students came out to jump into cold water to receive a t-shirt. They stood around at first listening to the water themed music from places such as Pirates of the Caribbean and other movies as they worried about how cold the water would be. After the first person jumped in, more people followed in nervous anticipation. The shirts they received were purple and said “oops, I double dipped!” referring to it being the second annual. Monday: Woman’s Basketball Game at 7 p.m. in Gore Arena. Free Camels for a Cure shirts! Greek Recruitment begins. Tuesday: Founder’s week Celebration begins. Men’s Basketball Game at 7 p.m. in Gore Arena. Dress up like Founder J.A. Campbell for a chance to win $250. Gaylord bobble heads will be given out. Wednesday: Founder’s Day Scavenger Hunt going on all day. Check out CAB’s Facebook, Instagram, and Twitter for clues all day long. Thursday: Women’s Basketball Game at 7 p.m. in Gore Arena. Friday: Men and Women’s Tennis matches at 2 p.m. At 3 p.m. the Founder’s Day Statue will be unveiled. T-shirts will be given out and free cupcakes. Wear orange all day long to celebrate! At 9 p.m. is Sleepless Nights in Carter Gym. Wear your pajamas and bring school supplies to join in with a charity dance. The campus was quite quiet this past weekend as many students went home. However, with this being the last full week of classes in the fall semester, the campus is buzzing again. On Friday at 6, CAB hosted a mocktail party serving cheese, crackers, fruit and of course, mocktails. As students arrived who signed up for the event, they saw easels set up with canvases. Each canvas had an outline of a camel with a palm tree. A wine and design company walked the students through the steps of painting their camel. Just because the picture was already drawn on the canvas, does not mean they all looked the same. Some students added sunglasses or added an army flair. At the same time as the mocktail party was the woman’s basketball game. They won against Pfeiffer. The men’s basketball team also won at their game following the women’s game. Tuesday: As part of Homelessness Week, watch a documentary in Turner Auditorium about homeless in Wilmington, NC. You can receive connections 200 credit. Wednesday: Winter Formal at 8 p.m. in the convocation center. Box-a-Thon in academic circle starting at 9 p.m. see what it is like to sleep in a box all night. Thursday: Mockingjay Midnight premire! If you signed up, the CAB trip leaves at 5 p.m.
Friday: Women’s basketball game at 7 p.m.
Watch The Soloist in Turner Auditorium at 9 p.m. There were many athletic events this past weekend starting with Volleyball on Friday night. Early Saturday morning, free Bojangles was served to students who came to the disc golf tournament. Winners were given gift cards and CAB discs were given out. 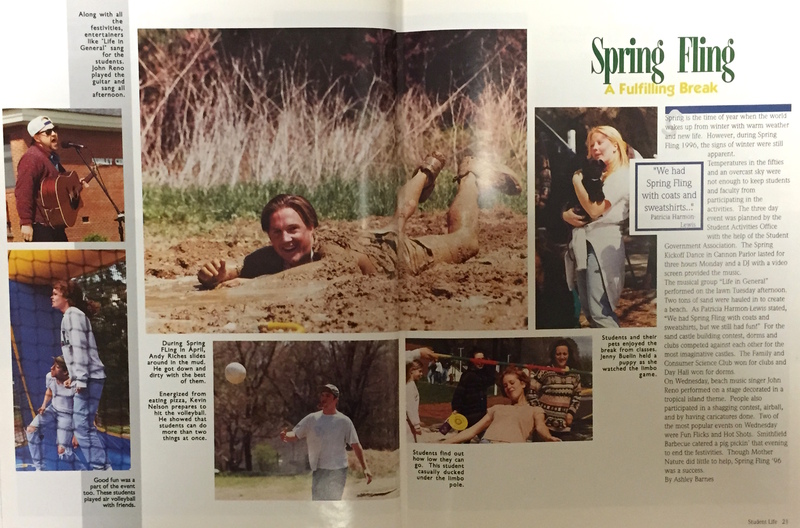 Later in the day, was the football game where we killed Missouri Baptist 66-7. The swim team also won their match against North Florida. The volleyball team won their game on Saturday as well against Liberty. This past Saturday was also the first time to students got to see the men’s basketball team in action in their preview. Tuesday November 11: CAB Game night in Shouse at 8p.m. Wednesday November 12: Jam Session in Shouse at 7p.m. Thursday November 13: Native American Heritage Night in the Rumley Center at 6p.m. Friday November 14: Woman’s Basketball Game at 5p.m. Mocktail Party-Wine and Design Event at 6p.m. in the Rumley Center. Make sure to sign up prior. Sunday November 16: CAB trip to see a Panther’s Game. Make sure to sign up prior.